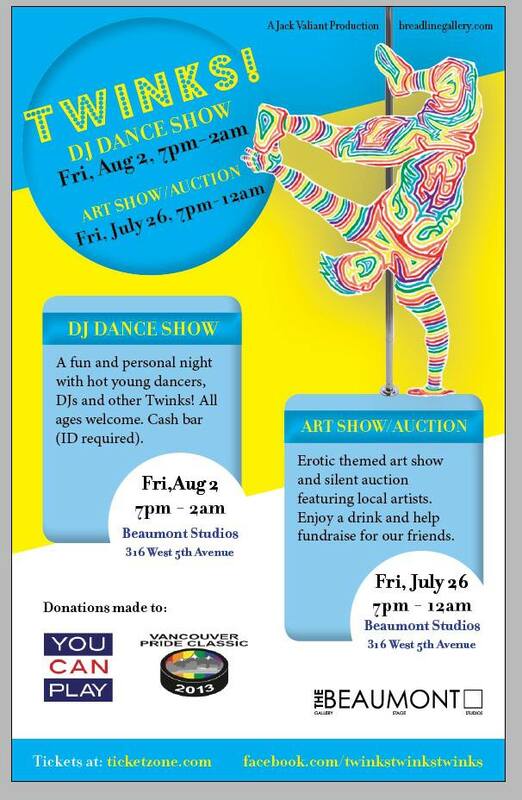 Twinks Twinks Twinks – A Vancouver based organisation that annually creates a Pride event, revolving around the youthful and fit twinks is pleased to present this year’s Art Show/Auction and DJ Dance Show!! Do you know what you like, fantastic art, and giving money to charity? Then this just the event for you. We got a selection of art to choose from, with a range or prices. You get a lovely piece of eroticness, and You Can Play gets part of the proceeds. Enjoy a drink, and help us raise money! The second installment for our Pride week events, from Breadline gallery! An all ages Electronic Dance Party, for everyone who just wants to party all night, regardless of preference or age! We got the just the DJs you need to celebrate your Pride weekend. All ages welcome. Two pieces of ID required for Cash bar. See last year’s Twinks Twinks Twinks 2012 event!